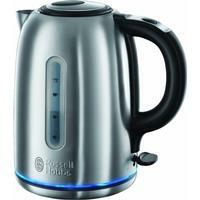 If you’re a UK buyer looking for an inexpensive but nevertheless stylish and highly effective kettle, then you should consider the Russell Hobbs Buckingham 20460. It’s fast, quiet, and looks fantastic. Russell Hobbs’ offering is a lovely-looking brushed steel upright kettle with an illuminated blue ring around its circumference that lights up when boiled. Either side of its sleek, well-designed body with an embossed Russell Hobbs logo, you have windows to check on the progress of your boil, with easy to read indicators telling you how many cuppas you’ll be able to brew. The kettle comes with a ‘perfect pour’ spout to prevent spills and overall feels lightweight yet tough – making it perfect for carrying, filling and pouring. The concealed element reduces the risk of limescale damage and increases the lifespan of this device, while it has a 360o swivel base with cord storage. There’s also an effective limescale filter which, although washable, is quite tricky to remove. Finally ,to cap off the design elements of this kettle (literally), to fill up there’s a nice little push-to-open metal lid. So we’ve established that the design is great – what about its effectiveness? The Buckingham 20460 takes a quickfire 150 seconds to boil enough water for four cups, but is also easily able to boil one cup at a time in just 45 seconds. It’s billed as having ‘quiet boil’ technology, which apparently makes it 75% quieter than other kettles, and it has to be said that this is no mere marketing rhetoric. It is one of the quietest kettles you’ll ever come across. If you were to gripe at one thing it would be that it’s quite difficult to access the interior for cleaning and, as mentioned before, the filters are quite tough to remove. Apart from that this is close to kettle perfection. Why you should buy it: The Russell Hobbs Buckingham 20460 looks lovely, boils rapidly and quietly, and won’t cost you an arm and a leg. It’s got some great features and comes highly recommended.